There’s no better way to power up at breakfast than with a hearty Spanish tortilla – and any leftovers are perfect for a no-cook dinner. Rise and shine everyone! Breakfast is on the menu today over at the Recipe ReDux. And we’re serving up lots of savory, protein-packed treats, that taste delicious for breakfast – or dinner. 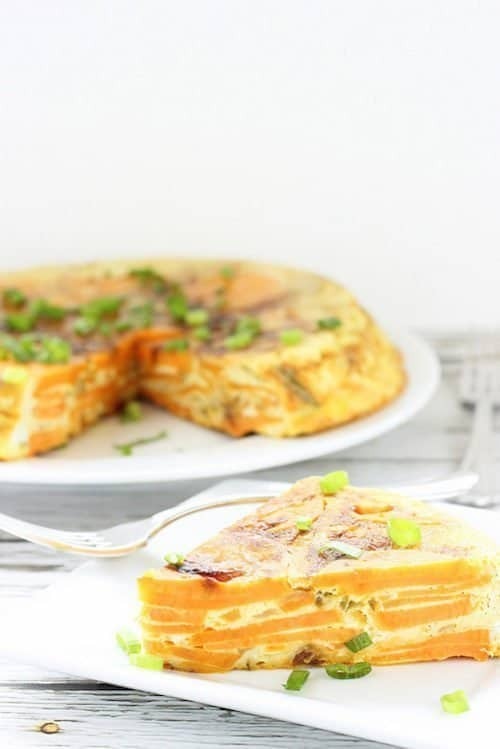 Like this Spanish tortilla. First, let’s clear up any confusion about the word “tortilla”. I know I usually think Mexican food and those flat round things made with corn or flour, but Spanish tortillas are a totally different animal. A Spanish tortilla, also known as a Spanish omelet, is like a frittata, but it has the added deliciousness of potatoes and anything else you want to add to the pan. It’s probably one of the most common foods served in Spain, where they have that wonderful tradition of tapas – small bites with a glass of wine. One of my best family vacation memories was Spain. We visited Seville, Marbella, and Granada when our daughter graduated high school. I knew our family vacations with just the 4 of us would soon be coming to an end, so I cashed out the frequent flyer and hotel points, and went big. We stayed in breathtakingly fabulous hotels that were once palaces, and explored everything from the beaches to the Pueblos Blancos, or white villages of Andalusia, to the ultra-amazing Alhambra, until we couldn’t walk another step. And we ate lots, and lots of tapas – including Spanish tortillas, full of crisp potatoes, golden onions, and usually some salty, Spanish ham, or jamón. 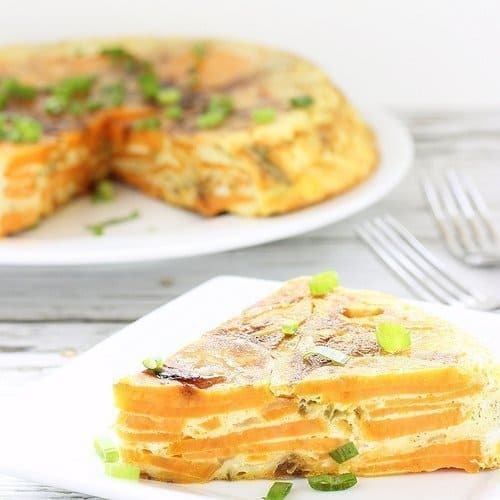 This Spanish tortilla is a little bit nontraditional. Because Hatch chilis just happen to be in season here in the Southwest, and sweet potatoes have such a lovely melt in your mouth sweetness, and everything’s better with some cheese. So they’re all playing together here. The absolute BEST thing about a Spanish tortilla – or really, any kind of frittata, is that you can make it for breakfast, and eat leftovers for dinner. Or if you’re like me, and not really a morning person, make it for dinner, and eat the rest for breakfast. It’s the ultimate multi-purpose meal. Preheat the oven to 350 degrees, and lightly spray a non-stick oven safe frying pan. Set the pan aside. Heat the oil in a saute pan, over medium-high heat. Add the onions and chili peppers, and saute until they are light golden brown. Add the garlic, and saute for another 30 seconds. Add the potatoes, and saute they start to turn brown in spots. Reduce the heat to medium-low, cover the pan, and cook for about 10 minutes, or until the potatoes are tender. While the vegetables are cooking, combine the eggs, milk, cheese, and salt in a mixing bowl or measuring cup. When the potatoes are fork-tender, transfer the contents to the prepared nonstick pan, and spread the potatoes out evenly. Pour the egg mixture over the potatoes and vegetables and with a spatula, work the egg mixture into the potatoes. Cook the tortilla over medium-high heat, until it starts to set. Transfer the pan to the oven, and bake for about 30-40 minutes or until puffed and golden. Let cool for about 10 minutes to set. Place a large plate over the pan, and flip it over to remove the tortilla. Slice and serve. Notes If you can't find Hatch chili peppers, substitute any medium heat chili pepper. If you make this recipe, let me see! Tag #CraveSomethingHealthy on Instagram. 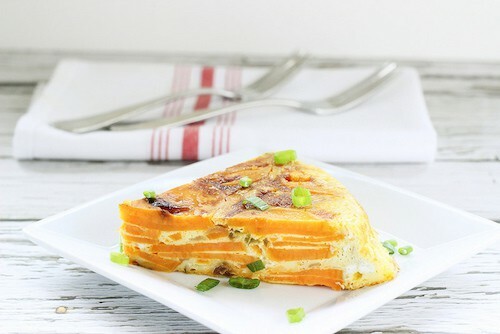 Looking for some other delicious savory breakfast ideas? Check out what the other Recipe ReDux members are cooking up! Oh – I LOVE that cheaters idea! 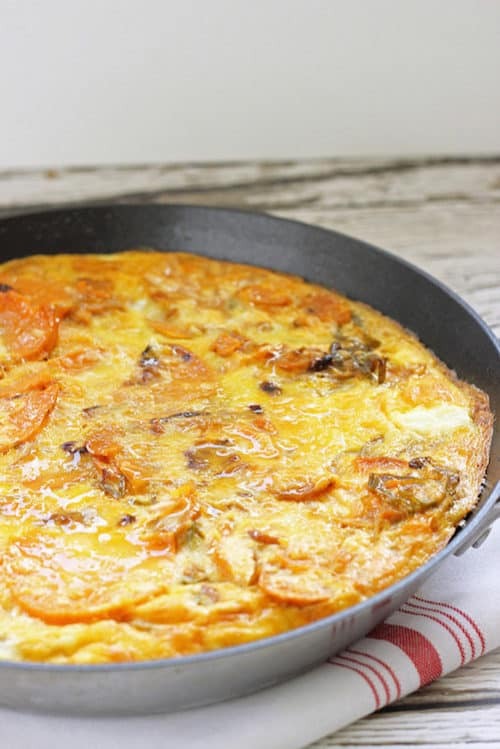 I love a Spanish Tortilla/Frittata for breakfast or dinner – so easy!